Both film and digital can be great if you are a good photographer, understand how each camera works and can use it correctly to get the best results. Neither will give good results, if you are not a good photographer. A crappy photo is a crappy photo regardless of what camera you used to take it. I should point out here that when I use the term ‘photograph’, I am referring more to a fine art print that you might hang in your drawing room, than to snapshots of your family, children and the family pet. Although there is no reason that you can’t make these records fine art prints too, they just tend to be more spontaneous and hence less planned and executed. I do not currently own a digital camera, other than the camera on the rear of my iPhone 4 and iPad. I do have a number of film cameras, two Olympus OM1n bodies with three primes and a a zoom lens, a Nikon F100 body, a 28-105mm macro and 50mm f1.8G, an Olympus XA2 compact, and a Fujifilm GA645Zi medium format ‘point and shoot’ camera. I used to have a little Canon S90 digital compact in the past, which was fun, but I only ever realy shot it in Auto or A mode, until it fell out of my pocket when I was riding along at 70mph and promptly went to camera heaven. Considering the cost of developing it, and the often lacklustre results which return from the lab, why do people still shoot film? As I look through the reams and reams of photos online, I am astonished at how many of them are complete junk. There may be 1000 photos, but if none of them are any good, that’s a fail in my book. It seems to me that the ability to take a photograph cheaply has reduced the photographer her’s focus. The pressing of a film camera shutter release button is a commitment, putting one’s money where one’s mouth is, and especially when dealing with fully manual cameras such as the OM1, you want to get it right. For 35mm film, each exposure costs you 61p, and 645 (the smallest medium format neg) will cost you 94pence per exposure (buying, processing and medium scanning at a good lab). If you are committing £1 for each photograph you take, you want to make damn sure that everything is just so before you pull the trigger. This interest to learn, to understand and improve your exposures, framing, composition, comes out of the desire to not waste money producing poor exposures. It is what has improved individuals’ photography through the ages, not having the ability to fire off unlimited exposures like some kind of light capturing scattergun. Shooting film poorly is like being fined for photographic incompetence, and it sharpens the focus. I mentally take far more photos than I actually expose. I frame them up to visualise the scene, but rarely snap unless they are worthy of the shot. This ‘pre-filter’ gives me the opportunity to question why I might want to take a photo in the first place. It is art? Is it a record of events? Is it a photojournalist type shot? Does it interest me, and if so why? More often than not I am standing, camera in hand, struggling to find worthy subjects for my photographic attention. It’s not that I need to be able to make more exposures, more that I want to encounter more photo-worthy opportunities. I use film precisely because it is so valuable. A photo (or a negative) is a special thing, it exists in reality and not just a stream of alphanumeric code. Film has a delicate softness that digital cameras struggle to reproduce. A good film photograph is more like art; in the same way that photographs replaced painting as the immediate means of image capture and portraiture, so the film camera is now moving into the realm of art, and the digital camera is becoming the new ‘instant’ capture medium. A lot of film users seem to think that by using film they automatically elevate their photographs into the lofty position of ‘art’. I am often disappointed to see the many frames of wasted film posted to flickr which are just awful. I know, I know, “art is art” you say, and you either get it or you don’t. Just because film has fallen to the hipsters, doesn’t make a Holga a magic wand, where everything snapped turns into some kind of wanky ironical statement, man. Taking an unfocussed photo out of the dirty window of a moving train of some rubbish on the ground looks more like an accidental shutter release. I certainly cannot see why they would have wasted a precious frame of film capturing that deliberately. It has no attributes of a good photograph. Photography is subjective, but crap photos are crap photos, regardless of whether you used a light sensitive film, or a light sensitive sensor to capture them. More often by the time they emerge from the digital darkroom, digital cameras will have produce images with a a punchier, more vibrant, more heavily heavily edited and retouched look, and I agree these can make great looking pictures. I do appreciate ‘larger than life’ photos, and as digitally rendered images become the norm, our eyes are attracted to the bolder than life colours, like moths to a flame. With the exception of the photo of Blenheim Palace which was adjusted for contrast and black and white levels, the remainder of the photos are untouched scans. But I submit there is still a magic to film, the bold saturated hues of Fuji Velvia, the only manufacturer still in slide film, or the desaturated, pastel shades of kodak Portra and fuji pro400h with beautifully handled highlights. If there wasn’t, why would so many companies make film simulation software? Film holds the magic that makes hollywood go to the considerable expense of shooting and scanning film to make ‘motion pictures’. Film takes an ordinary scene and turns it into something magical. I’m not sure the same can be said for digital. But film costs a lot, and the hollywood motion picture camera will go the way of the film camera – fine art. If one frame of 35mm costs 61p to buy develop and scan, a motion picture camera uses 30 frames per second. A minute of shooting costs about a grand in film alone. When the director yells ‘rolling’ the pressure is on. 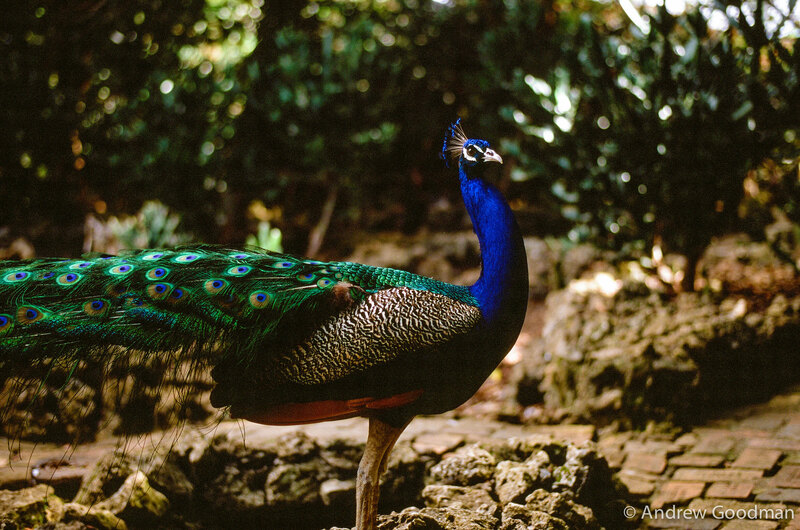 Barbados Wildlife reserve: Nikon F100, 50mm F1.8 and Fuji Velvia 50. Emulate those colours with digital! In my experience with shooting film, and in seeing the results of others work, FILM LOVES LIGHT. The word ‘Photography’ means ‘painting with light’, and it’s pretty hard to paint with light if there isn’t any. I love looking at the dreamy ethereal photographs of the famous wedding film photographers, Canlas, Villa et al, and wonder how they get their shots so beautiful. Of course, they use good glass Contax 645 and Zeiss 80mm f2 (which is equivalent to something like f0.9 on a 35mm camera, how’s than for creamy shallow depth of field? Perfect for dreamy eyed wedding photographs, but big and bulky and bloody hard to focus). They also use pro quality film, and shoot photographs in beautiful light; the few golden hours before sunset on bright sunny days, those dreamy golden backlit scenes. Anytime the light is softer and less harsh. Of course, they are cracking good photographers too, and know how to expose film, compose shots, and are personable people who make their clients feel at ease. They are also backed up by a very good photolab who knows how to scan film to their liking. Most negative film has excellent exposure latitude, and can be over or underexposed with acceptable results. Kodak Portra 400 and Fujifilm Pro400H are the main two negative films available and both produce great looking results if properly exposed, though you can get finer grain films 1.3 stops slower. The same cannot be said for digital sensors or slide film. You need to nail your exposures with slide film, and err on the side of underexposing digital, or you risk blown highlights. If you live in California, or are going on holiday somewhere sunny, you’re going to have a lot of fun with all of the available light when shooting film. When the light disappears, put your film cameras away and reach for the digital, or the high speed film (there’s only one) Ilford 3200. Digital cameras are more sensitive to light and work better when underexposed. Underexposed film just looks muddy and dull and will make you want to cry. There are some things that digital cannot replicate, though they will often try, because the film process is chemical, and the results of the chemical soup are not repeatable. Take cross processing slide film for example. Digital photography has brought the darkroom back into the hands of the photographer. Whereas with film, you are paying your money for the light sensitive media, and that is where the magic happens, that and in the scanning process. LR5 is not really designed for adjusting film scans, but it works well enough. There is a temptation to turn your photos into digital looking files, and lightroom will do this for you. I want my photos to look like they were shot on film, so I leave them mostly alone. we often make life so black and white. If who eons asks you to choose film or digital, why not choose film AND digital. The truth is film photographers benefit from digital technology, and digital photography emulates film. Two happy mediums coexisting and bringing a great amount of joy to the photographer. I am planning to buy a digital camera, something small and capable for instant capture. I think I’ll check out the Fujifilm X100 the third. I like the leaf shutter fixed lens combo, it suits my shooting style. My first MF camera was a Yashicamat 124g which had a near silent leaf shutter and worked well handheld to 1/15 of a second. I also love the retro looks, the compact size (compared to my GA645Zi which looks like a camera on steroids), and the image quality from the little X100T. I have shot quite a bit of slide film, so am prepared for the reduced exposure latitude of digital. Just need to gather up £1000 pounds of spare cash, and I’m good to go. I’ll keep you posted. I hope that film use picks back up, it would be great to have more Fuji and Kodak development into new film products. Maybe the hipsters will save the day after all.